From caves close to the Patriotic Union of Kurdistan (PUK) headquarters around Bergalou and Sergalou, commander Kamaran Ali Amin witnessed a poison gas onslaught in February 1988 that changed the course of the Kurds’ war against the Iraqi central government. The attack on the PUK base was as dramatic in its impact as Germany’s first gas attack on the Allied frontline during World War One at Ypres in western Belgium. Kamaran had been tasked with policing the main roads leading to the PUK headquarters. His unit lived in caves during the day and only moved at night to avoid capture. His fighters faced a vastly superior force and relied on the guerrilla tactics which had made the peshmerga such a formidable enemy for the Iraqis. A few hours after midnight on 24 March 1988, he saw a star-like object in the night sky which, unbeknownst to him, signalled a massive shift in the Iraqi army’s strategy towards the Kurds. The next morning Kamaran learned that the PUK headquarters had been attacked with poison gas. Shortly afterwards, he received a letter from his superiors ordering his unit’s immediate withdrawal. Worried that this order might trigger panic, he told his men that another unit was about to take their place and that they should prepare to leave. The events of that day caused a massive collapse of PUK morale and left Kamaran with peshmerga in his unit threatening to commit suicide. 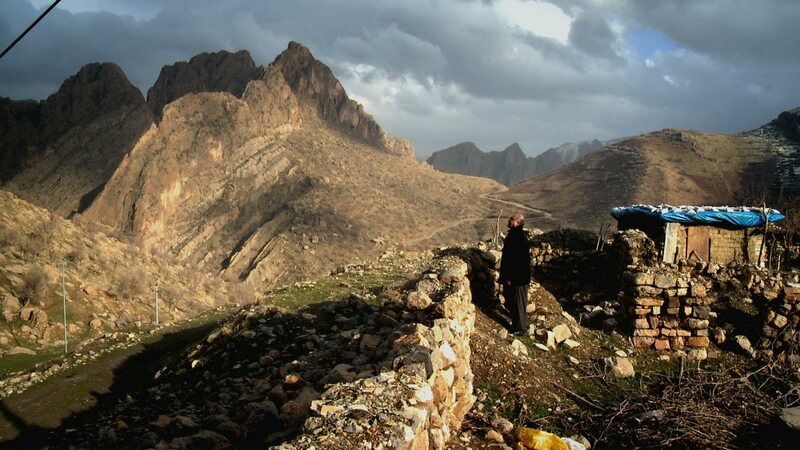 With the weather worsening and snow–storms sweeping the Zagros mountains, Kamaran’s unit fled in disarray. Along the way they saw mules and donkeys floundering in snow drifts, unable to free themselves. They abandoned their equipment – munitions and heavy guns – as they threaded through narrow icy paths and deep chasms. The frozen bodies of Iraqi and Iranian soldiers who had fought in the Iraq-Iran War and perished in the snow, littered their route along with discarded baby clothes. The peshmerga finally reached Iran but within weeks were on their way back to Iraq to resume the fight against the Iraqi army. In April 1988 they crossed back into Kurdistan and headed towards Goptapa, 50 km west of the Iranian border. As they trekked towards their destination, the Iraqi army launched the Fourth Anfal, its numbers swollen by large numbers of “jash” forces. These were Kurdish mercenaries who were fighting alongside Iraqi troops and who were drawn from tribes living in this area. Once again, chemical weapons formed a key component of the Iraqi arsenal and Kamaran and his peshmerga companions decided to fight to the death. In one of the most dramatic escapes of the war, Kamaran and his battalion walked for days without sleep or food and finally found sanctuary in safe houses in Sulaimaniya, a town controlled by Iraqi forces. Kamaran helped plan the Kurdish uprising in 1991 by stockpiling goods, especially petrol, to use when fighting started. He remembers the unconditional support the public gave the peshmerga at the time, something that has left a deep impression on him. During the 1980s the main headquarters of the Patriotic Union of Kurdistan (PUK) was situated in Bergalou. It was destroyed during the First Anfal campaign in 1988, but the site has since been restored as a memorial.